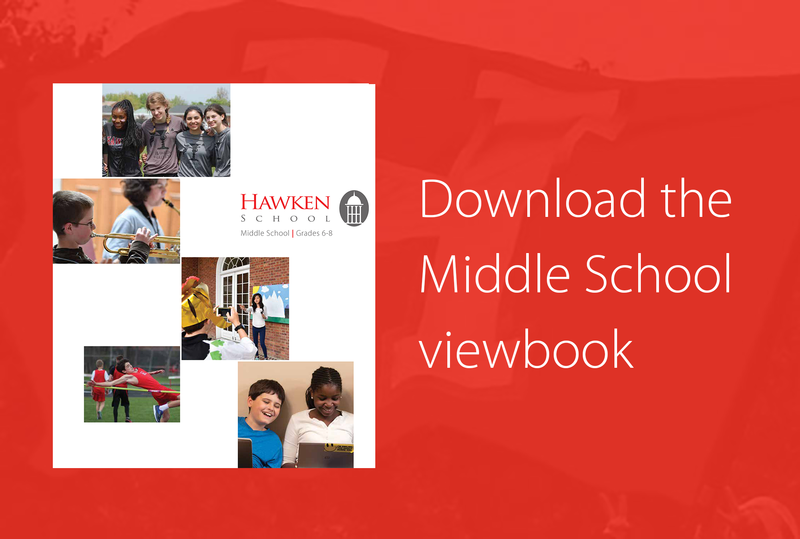 At Hawken, we understand that Middle School is a unique and exciting time in your child’s life – a period of remarkable physiological, social, emotional and cognitive changes that result in profound growth and learning. For students, it’s a time of evolving identities while learning how to manage their increased independence. For parents, it’s a time of adapting to your children’s changing needs and thinking ahead to their future. We understand your child’s need for both independence and guidance. Through our character-based environment and rigorous academic program, we partner with you to ensure that your child receives the optimal balance of structure, freedom, nurture and support that will enable him or her to successfully navigate this exciting and challenging transition into adolescence. With a focus on hands-on learning, our Middle School program enables your child to be an active participant in his or her education. By exploring science, math, and the humanities using an interdisciplinary and experience-based approach, students dive deeper into subject areas and become immersed in the process of learning and discovery. Our school day is built around a schedule that is intentionally structured to support your child’s educational growth. Teachers are readily available to offer your child help and guidance in any area and to facilitate interactions and conversations outside of the classrooms. Asking questions is encouraged, and students are given the tools to self-advocate, taking charge of learning through frequent collaborations and exchanges with both teachers and other students. A fondly remembered Hawken rite of passage, the Chapel Talk is a nine-minute speech delivered by each eighth grader to the entire Hawken Middle School student body and faculty, as well as the speaker’s family and special friends. The Chapel Talk is the culmination of a student-written, research-based position paper that is part of their Humanities curriculum. As an eighth grader, your child will stand at the door of the chapel as students file in one at a time to greet him or her with a handshake, hug, and/or encouraging word. By the time your child approaches the podium, he or she will have received heartfelt encouragement from over 200 people from the Hawken community. Throughout the Middle School years, your child will take curriculum-based trips at the end of the year’s study that serve as a culminating experience to his or her intellectual and personal growth. These trips showcase the incredible transformation students experience as they become accustomed to applying concepts learned inside the classroom to the world around them. 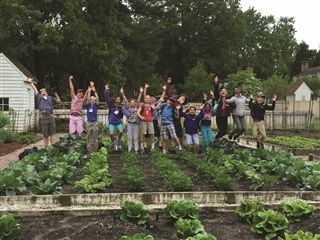 Sixth graders visit Williamsburg, seventh graders travel to Washington, D.C., and eighth graders backpack through New York City. 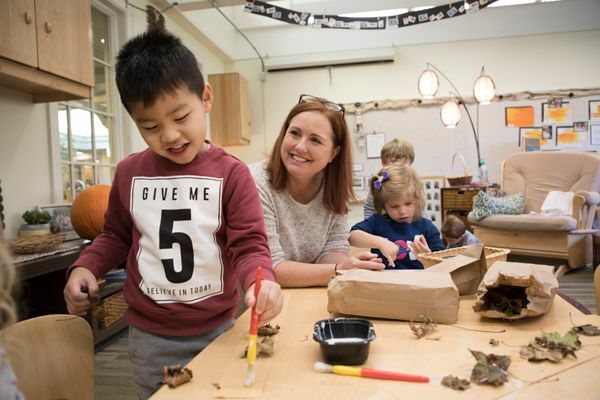 While the Doorways trips are supervised by faculty, students are given age-appropriate opportunities to exercise independence and responsibility as they learn to navigate new places and experiences. Located on our Lyndhurst campus in Lincoln Hall, Hawken Middle School is structured around identical clusters of classrooms called “pods,” one for each grade level. These pods were intentionally designed to provide opportunities for your child to connect and converse within his or her grade-level community. Establishing a solid academic foundation is essential to your child’s intellectual development. Our program focuses on building upon strong academic skills while placing an increasing emphasis on personal responsibility. We emphasize adaptability and creativity in our approaches to instill excitement and enthusiasm for learning and to build your child’s confidence and problem-solving ability. Each January, the Middle School returns from winter break to experience Hawken’s annual Insights Week: five days of multi-grade level courses designed to inspire and inform. These interdisciplinary courses include a wide variety of innovative and engaging topics that stem from the passions of the Middle School faculty. Using the greater Cleveland area as a resource for projects and explorations, your child will develop skills of collaboration, synthesis of information and critical thinking through real world experiences and inquiries. Past courses offered include Anatomy of a Hit Song, Stories of Cleveland, Stress Less, and The Science of Sport. Click here to learn more about Insights at Hawken. Assemblies in the Middle School are entirely student-led. 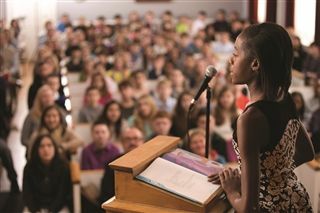 As a seventh grader, your child will have an opportunity to open the meeting; as a sixth grader, he or she may share something that happened “on this day in history;” and as an eighth grader, your child may formally introduce the Chapel Talk speaker or, call on faculty members and others who have news or information to share with the community. 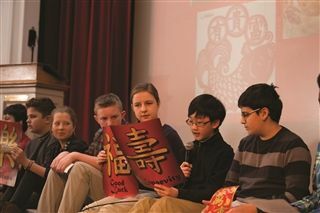 While the “pod” structure of Hawken Middle School builds community within each grade level, Middle School Assemblies fosters connections between all grade levels, providing opportunities for students to share with and learn from one another. Your child will become a member of a small student group that will be paired with a faculty advisor who provides academic, extracurricular, and personal support to each student. Each advisor adheres to a social/emotional growth curriculum that is developmentally scaffolded for grades 6, 7, and 8. The curriculum focuses on important skills relating to personal identity, teamwork and collaboration, and problem solving and decision making. Your child will also participate in Service Learning as part of the advisory curriculum. At the start of each school year, advisors reach out to students through a letter home to students, placing schedules and nameplates on lockers, and spending extended time in advisory period to build understanding and community with their advisees. Our annual student-led conferences allow us a key time for your child to lead the conversation between you and the advisor, focusing on goals and growth over the course of the year.